Short and petite, Rukia is among one of the shortest characters in Bleach (especially for her physical "age"), easily being towered over by people of Chad's or the Espada's height, such as Nelliel Tu Oderschvank. She has pale skin and dark hair, she somehow manages to always keep a stray bang in between her eyes. She has a purplish eye color which at times looks as if they have some dark-blue in them. Byakuya said to Rukia that she strongly resembles her older sister and his own wife, Hisana Kuchiki. 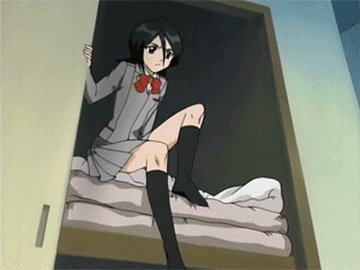 Initially born into a lower class, Rukia retains her modesty even as an adopted member of the nobility: she is graceful and "clean", yet chooses to talk to ordinary people. However, her cool and lone demeanor often forces her to hide her personal troubles even from her friends. Although she tells Ichigo that she is nearly ten times older than he, she is endearingly clueless about the ways of the modern living world (since Soul Society resembles Japan's Edo period). She is initially unable to figure out how to drink from a simple juice box, and learns to speak modern Japanese through the manga she reads. She has trouble finding clothes that fit her, due to her stealing clothes from Ichigo's sister, Yuzu. She likes to climb high places and rabbit themed items and her favorite foods are cucumbers and eggs. In the Bount Arc, Ririn, one of the modsouls that Kisuke Urahara invented, is jealous of Rukia's familiarity with Ichigo, while Rukia instantly takes a liking to Kurōdo, who resembles Chappy the Rabbit in his plushie form. This makes Kon break down and start crying, as he believes that no one (meaning Rukia, though there may be some truth to it) cares about him anymore. Orihime Inoue is somewhat jealous of Rukia, until Rangiku Matsumoto explains how both of them are important to Ichigo, just in different ways. Nelliel Tu Oderschvank, when she was in her child form, also becomes somewhat jealous of Rukia's friendship with Ichigo; It is unclear when Ririn and Nel Tu decide to continue their unnecessary jealousy or overcome it, as the series continues. Her attitude towards Ichigo varies throughout the series. At times, she is a bickering adversary, and at other times, she worries about him and dispatches advice like a wise old sage. Most of their scenes together involve yelling and making faces at each other like bickering siblings. Despite these quarrels, the two have a deep understanding of each other, often being the only ones able to talk each other out of a funk. There is a deeply serious side to Rukia as well, best shown during the time she was taken back to Soul Society for giving her powers to Ichigo. In her time in Soul Society, which she spent in various holding cells, she is constantly seen resigned to her fate or in deep thought. She and Ichigo also have similar feelings of loss and guilt. Ichigo thought he was responsible for his mother's death and Rukia's near execution. Rukia thought she was responsible for the death of one of her commanding officers, Kaien Shiba, and considered Ichigo's apparent death her fault. Rukia also seems to befriend males easier than she does to females and probably enjoys their company more, as she hardly ever goes to Shinigami Women's Association meetings and seems to be around Ichigo and Renji the most. While in the living world, it is shown that she is often uncomfortable in the presence of so many girls while at school. However, she and Orihime grow close, especially when they go to the Soul Society to train together, somehow finding a new understanding of one another during the Arrancar Arc. Rukia's favorite foods are cucumber, eggs, and rice dumplings. She likes to climb to high places, and everything that is rabbit-themed or resembles a rabbit which explains her affection toward Chappy, the rabbit, and the fact that her drawings about people always look a little bit rabbit-like. She always has trouble finding clothes that fit her, especially when inhabiting a Gigai in the human world.